slow draining bathtub - is a frozen pipe a possibility? Our bathtub has recently started draining very slowly (bathtub fills with water during a normal shower and takes a while to completely empty). This problem has coincided with winter, and I'm wondering whether it is possible that the drain pipe (maybe the bend in the pipe) in our crawlspace could be freezing? We live in Boise, ID where it is not super cold in the winter, maybe 30s - 40s during the day, and in the 20s at night. The house was built in the 1940s, and the drain pipe is cast iron. It goes down into our crawlspace, which is uninsulated (just dirt covered with plastic lining on bottom of the crawlspace surrounded by the concrete foundation). Does anyone know if there's a good way to determine this? And how we could remedy the situation? Would foam pipe insulation do the trick? PS - no problems with other things in the house draining (sinks, washer). It seems pretty unlikely that the drainpipe would freeze in your crawlspace. Even if there was a 20 degree wind whipping through it (which there isn't: it's enclosed), the only way that could be is if there was standing water in the pipe to freeze. That would mean a trap in the crawlspace which would be highly unusual. And if you really had a frozen pipe, it wouldn't drain at all. Most likely you have a hairball in the drain. Try a "drain zipper" and/or a drain auger. When buying a hand auger, it's worth it to pay more for one with a toggle lock as opposed to a thumb screw. It will save you a ton of time and your hands will thank you. If that was the case the bathwater would melt the ice plug in short order (unless it was totally blocked). I suspect a common debris plug. Also, it usually takes much colder weather to freeze things in a crawl space. Geothermal heat typically prevents it unless you have a lot of ventilation. Cast iron corrodes and accumulates very hard crud over time. You may get away with a good hard auguring, but you may end up digging up the iron pipe and installing PVC or ABS. It's not usually a difficult job, access permitting. My thought here is that rather than a pipe being frozen, it might be a vent. This observation already appeared in a comment, but I think that it deserves the visibility of an answer. Also, I have more to say than is covered in the comment. As several people have noted, an ice clog is unlikely to cause a slow drain. This is because the warm water would tend to melt the clog. However, that's not true of a vent. A vent would typically be a pipe running from your trap up through the house to the roof. As such, the part that would freeze would be at the other end from where the warm/hot water is. Further, a blocked vent can be entirely obstructed and water will still flow slowly, which is the problem that you're having. This question has photos of a piece of internal venting, an air admittance valve connected to a drum trap. I'm talking about external venting, which would look similar at the trap connection end but the other end is outside. You might be able to see the trap connection from the crawlspace. Or not. If you can't see the top of the trap from the crawlspace, then you might not be able to see the venting either. Here is someone who was having problems with a frozen vent pipe. There are no answers, but a comment helpfully points to this question on unfreezing pipes. If this is the problem, you should be able to see a pipe rising from above the bathtub in the attic (assuming you have one). You might try wrapping it with heat tape and seeing if that gives the external vent (on the roof) enough warmth to melt off. As always, be careful about mixing electricity (the heat tape) with moisture (the cold vent pipe). Note: I'm not saying that this is definitely the problem that you're having, nor that other ideas are wrong. I'm saying that this is one possibility that may be worth considering, as it would explain the observed behavior without resorting to coincidence. A problem with venting might also be caused by snow coverage (rather than ice). Perhaps the air is being blocked by an accumulation of snow. A house that I rented once would have plumbing issues if a vent was covered by leaves or snow. So the landlord would first clear off the vent if there was a draining issue. That vent was in the ground, several feet from the house. So if you can't find a vent coming from the bathtub trap, you might look around for other parts of the vent stack that might be blocked. Here are some products that I have used for years and would recommend before spending a lot of money with a plumber. 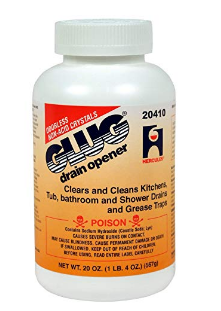 Glug drain cleaner is a non-acid formula that works really well when you first experience a sluggish drain. Crystal Heat is actually crystalized Sodium Hydroxide and Sodium Nitrate. You can't use this when there is standing water. Remove the drain stopper and pour about 1/4 cup down the drain and add a small amount of water. This stuff will boil and heat up to a point that it will actually melt grease and soap scum. It will also burn out hair clogs. Finally, start using an active enzyme drain maintainer such as Tough Guy to help prevent future clogs. According to the respective manufacturers: Each of these products are safe for all plumbing applications and septic systems. You probably have an obstruction in the shower line or in the main line after all the pipes have come together in the stack. One thing you can do is to access the stack main line and see if water is passing through by flushing the toilet or running the shower. If you see a good stream of water then the blockage is further downstream. If you see a trickle, then the blockage is upstream in the particular pipe which in this case is the shower. If you see water going through the pipe then the blockage is downstream and could mean a frozen pipe or obstruction further down in the main line. Either case would be to snake to remove the obstruction or call a plumber to remove it. That said, I'm going to throw in with the others that given your symptoms, ice is unlikely the cause of your slow drain. Any water flow will cause the ice to melt and resolve any initial slowness (except in the coldest of temperatures, some rivers/streams do freeze over after all). You can verify this by leaving the water running for a few minutes. If it starts slow then after several minutes drains normally, it might have been a partial blockage from ice. If it behaves like this on a regular basis (starts slow then clears normally after a few minutes) then it may be a consistent issue, and you may benefit (like I did) from leaving the water on at a trickle to prevent standing water in the traps during the cold months. In addition to metal pipe corrosion as mentioned by @isherwood, there may also be mineral deposits if you have relatively hard water. This is especially common in horizontal runs of pipe -- and the longer the run, the more likely this is to be a problem. Since mineral deposits will partially block the pipe, they also make the pipe that much more sensitive to the occasional debris plug. Unfortunately they also make the use of an auger much more difficult. I haven't personally tried a snare as recommended by @JimmyJames but my guess is that would have a higher chance of being effective than an auger (assuming the snare is long enough to reach the plug). Not the answer you're looking for? Browse other questions tagged plumbing drain pipe bathtub or ask your own question. Is there a way to thaw a frozen pipe, if you can't access the pipe? How to protect plumbing to an outbuilding from freezing? Should I caulk around this drain pipe?